And some additional context here. Heard this the other day and didn't want to forget it. Being Earth's Most Customer-Centric Company. There is a proven link between creativity and effectiveness in advertising and marketing. The Case For Creativity has this summarized and presented very well. Creatively-awarded campaigns deliver 11x the ROI and they are more effective at gaining market share. Creative marketers are companies who outperform the stock market by 3.5x. Those campaigns that get talked about are more efficient, have a more dynamic brand impact, and cost less. That, and lots of other wisdom, summarized here. Readers of Martin's blog should enjoy this summary of his Firestarters talk. This was just a fun read, and I agreed with everything except for a small * on the first thing: choosing the right name. Truth: There are better names and worse names, clear names and confusing names, really strong names and really weak names, clear names and confusing names, strategic names and not-so-strategic names. The Rolling Stones is a great name: far better than Little Boy Blue and the Blue Boys. But, in general, the brand makes the name. It's the gestalt of the whole thing--something good has a way of making for a good name. Is Target a "good" name? How about Radiohead, Dreamworks, Tesla or Android? If these things were crap, names like these could be looked upon much differently. But it's nearly impossible to have your mind go there, isn't it? Their names are good largely because they are good. Flip side--if your name is lululemon, Dr. Pepper, the Goo Goo Dolls or FourSquare you have to work that much harder to impute desirability into what you call yourself. This was referenced during a speech at MarketMix by Patrick Byers. The capo d'astro bar is a great advertising story that was written in the 80s. Searching for the story took a few attempts, so I thought I'd re-post it here. Back in the sixties, I was hired by an ad agency to write copy on the Aeolian Piano Company account. My first assignment was for an ad to be placed in The New York Times for one of their grand pianos. The only background information I received was some previous ads and a few faded close-up shots…and of course, the due date. I acknowledged his perception that I was one of those, which got us an immediate audience with the head of our agency. I volunteered I couldn't even play a piano let alone write about why anyone would spend $5,000 for this piano when they could purchase a Baldwin or Steinway for the same amount. Both allowed the fact they would gladly resign the Aeolian business for either of the others; however, while waiting for the call, suppose we make our deadline. I persisted and reluctantly, a tour of the Aeolian factory in Upstate New York was arranged. I was assured that ‘we don’t do this with all our clients’ and my knowledge as to the value of company time was greatly reinforced. The tour lasted two days and although the care and construction appeared meticulous, $5,000 still seemed to be a lot of money. Just before leaving, I was escorted into the showroom by the National Sales Manager. In an elegant setting sat their piano alongside the comparably priced Steinway and Baldwin. ‘They sure look alike,’ I commented. I left the National Sales Manager under his piano and dove under the Baldwin to find a Tinkertoy Capo d’astro bar at best. Same with the Steinway. ‘You mean the Capo d’astro bar really doesn’t go to work for 50 years?’ I asked. ‘Well, there’s got to be some reason why the Met uses it,’ he casually added. Upstate New York looks nothing like the front of the Metropolitan Opera House where I met the legendary Carmen, Rise Stevens. She was now in charge of moving the Metropolitan Opera House to the Lincoln Center. That quote was the headline of our first ad. The result created a six-year wait between order and delivery. 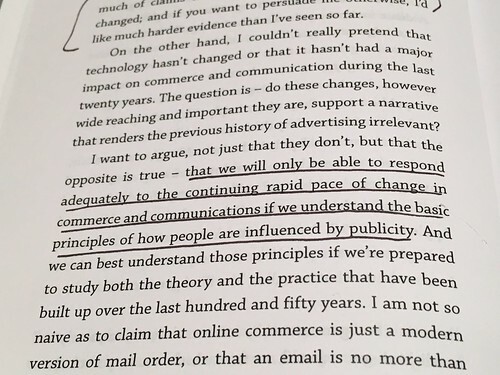 We will only be able to respond adequately to the continuing rapid pace of change in commerce and communications if we understand the basic principles of how people are influenced by publicity. This was on page 16 of The Anatomy of Humbug and, upon reading that, I had a hunch the book would be good. "How people are influenced by publicity" is a great choice of words. It's naturally big so it's no surprise that the answer varies. But that shouldn't be frustrating. 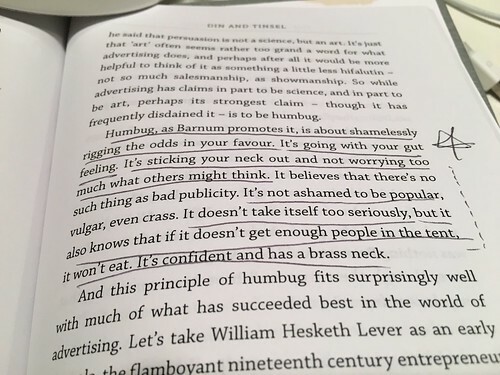 And that's the genius of The Anatomy of Humbug--it provides confidence and structure while at the same time requiring the practitioner to study their own situation and apply the right answer from a collection of approaches. Paul Feldwick confirms several things in this book that I have long believed but couldn't articulate in a way that I liked. Such as how many advertising and marketing people have long-argued for the USP--but that's not always right. In fact, it's often wrong. Equally, others have argued for all emotion-based campaigns. But that's not always right either. But not all of them, all of the time. Throughout the history of advertising each of these approaches have been overstated, often by the practitioners who coined (and sold) them. But none of these theories on their own can claim that they are 'how advertising works' because it depends on the brand and what needs to be accomplished. What is required is deep understanding of the business problems--and the true purpose of the brand at-hand--and then applying whichever type of advertising theory satisfies them best. And it's often about choosing several of these. Within the same brand there are times when an ad should be a salesperson. There are other times when it should seduce. As it does both, a campaign should have salience. And so on. If everything is done well it creates business-driving advantages, hence the title of the book. "...rigging the odds in your favor." Any brand can do this. Every brand should do this. And doing this takes deep study, lots of preparation and great creative thought. Letters of Note chose to profile Bill Bernbach's classic 1947 letter to the management of Grey. It was great to re-read. It's a reminder that we have to talk about the tactics of new channels so that we can understand them. We must measure performance so that we can give people more of what they need and less of what they don't. We need to study the fundamentals of branding and marketing and selling. Doing this provides us with the confidence to then blaze new trails for ourselves. And it's in this spirit that re-reading this letter from time to time always ignites a spark within.